Today we are excited to launch the Center for Policy Impact in Global Health, based in the Duke Global Health Institute, a new kind of policy lab that will apply design thinking principles to address critical challenges in financing and delivering global health.So what are these challenges, and what do we mean by design thinking principles? A gap in donor financing of crucial global public goods for health and other “global functions.” Donor financing for health has flat-lined in recent years and too little of it has been directed at global public goods for health—such as developing new medicines for neglected diseases of poverty—and at other “global functions,” such as preparing for pandemics. A “middle income gap” that can arise when countries graduate from aid for health. Middle-income countries (MICs) are increasingly seen as being “too rich” to qualify for donor assistance, yet most of the world’s poor now live in pockets of poverty in MICs, resulting in major health disparities in these countries. A domestic health financing gap in low-income countries (LICs) and MICs. Many LICs and MICs allocate too few domestic financial resources to health, achieve poor value for money in their health spending, and rely too heavily on private out-of-pocket spending—a major cause of catastrophic health expenditure. 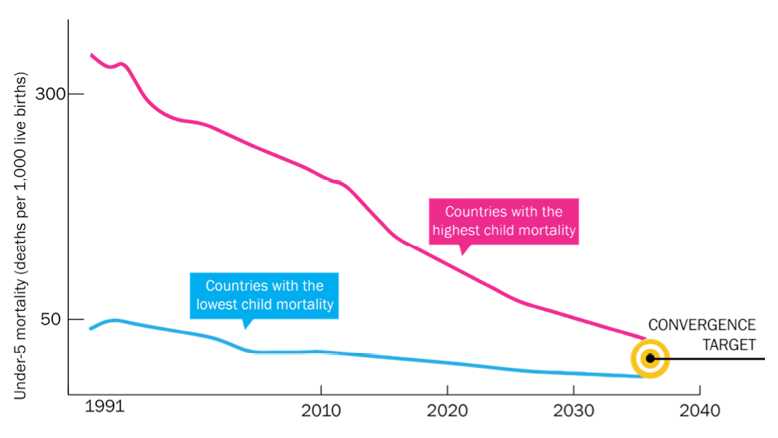 Taken together, these gaps threaten the achievement of the health-related Sustainable Development Goals and of a “grand convergence” in global health—a universal reduction in avertable deaths from infections and maternal and child health conditions (figure). When we talk about using design thinking principles, we are describing the way in which we aim to approach these challenges, including using creativity, bringing in “big thinkers,” and testing out different solutions. Design thinking involves a 3-stage process of (1) gaining a deep understanding of the problem and its context (how it fits into the broader system); (2) “ideation” (ideas are generated, developed, and tested in order to develop solutions); and (3) modeling the impact of these different solutions. Our Center will marshal this approach to help quantify and close major gaps in the current system of global health financing. We’ll support two Global Health Policy Fellows each year, from low- or middle-income countries. These Fellows, representing future health leaders, will help to “reality test” the lab’s proposed solutions against conditions on the ground in LICs/MICs. What is our overarching aim? Support two partner countries to identify ways to mobilize more domestic resources for health, including through improving current tax and budgeting systems. It’s an ambitious agenda, but we have a team in place both at Duke and around the world, with a wide mix of backgrounds and skills, ready for the challenge. Today, the work begins in earnest. We are hosting a working group on International Collective Action for Health (ICAH) in Doha, Qatar, chaired by Lawrence Summers, that will guide our analysis on global functions. The working group meeting is timed with the World Innovation Summit for Health and brings together a diverse group of economists and global health experts,. We hope you’ll follow us on Twitter or Facebook, read our regular Policy Blogs on the Center website, and reach out to us if you see opportunities for working together.